The EHF has announced that it has opened the bidding process for future Men’s and Women’s EHF European Championships. However, in a change agreed by the EHF Executive, host nations are being sought for the next four EHF EUROs to take place in 2018 and 2020. Upcoming events have already been allocated, with the Men’s EHF EURO 2014 to take place in Denmark in January and the Women’s EHF EURO 2014 in December. Poland will organise the Men’s EHF EURO 2016 and Sweden the women’s event. 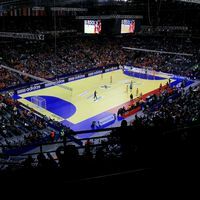 The change has been introduced to allow organisers more time to provide the infrastructure required for a major international event such as the EHF EURO. The decision on the host nations will be made by the 2014 Ordinary EHF Congress set to take place in Dublin, Ireland on 19/20 September 2014. Federations bidding for the organisation right for the events have until 4 September 2013 to submit an initial letter of intent and until 10 December 2013 for their detailed proposals.